The Game Of Thrones producers have been going to extreme lengths to keep the secrets of their eighth and final season securely under wraps. Pretty much all we know is that the final six episodes will be very bloody and very expensive, which, frankly, could be said about every season up to this point. This lack of tangible, credible information about the finale forces us to do just one thing: Speculate wildly about how this show is going to end based solely on an Instagram post of Maisie Williams’ shoes. “Goodbye Belfast. Goodbye Arya. Goodbye Game Of Thrones,” Williams wrote under an image of a pair of blood-spattered sneakers. “What a joy I’ve had. 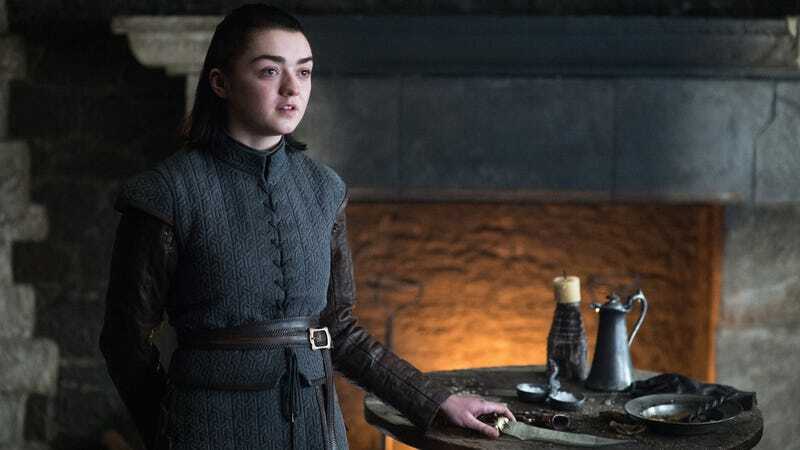 Here’s to the adventures to come.” Now, the obvious conclusion that can be drawn from this image is that the series finale finds Arya being transported to the future where she buys some cool, modern sneakers before judiciously slaying everybody in the mall with her epic sword skills. But we’re willing to bet the sneakers are a red herring. The real intriguing part of this post is Williams’ use of the #lastwomanstanding hashtag. It could, of course, be a cheeky reference to her being the last female cast member to wrap on shooting. But it could just as easily refer to her character. There’s something satisfyingly tragic about the youngest Stark girl outliving Cersei, Daenerys, and even her own sister Sansa. And, last month, Jason Momoa, who hasn’t appeared on the show since season one, paid a visit to Ireland where he claimed he just wanted to “celebrate” with his friends. But don’t act surprised if a ghost of Khal Drogo makes an appearance in the final season. So, really, bloody shoes is all we have to go on right now. But there’s still months to go before the eighth season premieres, and plenty more overanalyzing that can be done until then.